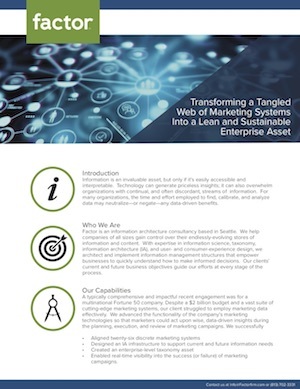 How Factor helped transform a tangled web of marketing systems into a lean and sustainable enterprise asset. At Factor, one of our current engagements is with a Fortune 50 multinational technology hardware corporation. It’s been such an impactful and rewarding experience for both our client and Factor that we decided we’d like to tell the story. Senior executives from this client’s marketing division wanted to find out if their marketing campaigns were meeting their business objectives and goals. They had a large marketing budget, great technology, good executive support, and substantial staff. Even with these things in place, they still couldn’t generate executive reports on the impact of the company’s marketing initiatives. Our client’s problem was not an IT or technology integration issue; it was an inability to organize, manage and share information from different sources. At our client’s request, the Factor team jumped in. We identified more than 19 taxonomies across 26 different marketing systems. Then we classified terms and definitions to build a model that created a consistent vocabulary. As part of the process, we helped educate stakeholders and employees—providing our client’s team with resources to navigate internal tensions around implementation. Over the course of a year, we helped our client shift from 26 distributed and overlapping taxonomies to a model that provides a definitive set of taxonomies as a service that is centrally managed. Download our story. Share it with your colleagues. Let us know about similar challenges you might face in the comments. Or contact us directly to see how we might help you.